After 18 years with a corporation in Ft. Worth, Texas, Paul resigned as Executive Vice-President in 1973 to become a full-time artist. During this time, over 160 subjects have been sculpted in commissions and limited editions. Paul is one of America's leading sculptors who has created works that grace prominent public displays, museums, galleries and private collections around the world. 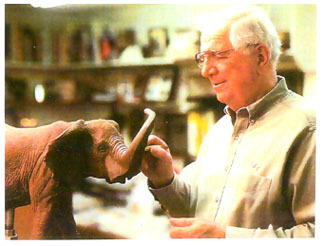 Because of his love for the outdoors, hunting, and wildlife, it was natural he would sculpt wildlife. But demands to sculpt the human figure has grown over the years to the point it is over 50% of his work. Through his art, Paul has helped raise hundreds of thousands of dollars for special community projects, children's organizations, and wildlife conservation. Many awards have come his way since he began sculpting. He has been written up in Peterson Hunting Annual, Southwest Art and Art Gallery magazines, Sports Illustrated, Forbes magazine, and numerous newspapers across the country. God has blessed Paul and his loving wife, Georgia with three children, six grandchildren, and one great-grandchild. He and Georgia reside in the Hill Country near New Braunfels, Texas.